November 19, 2018 – GOD IS LOVE: COMFORT THROUGH TRIALS is available for download now. March 7, 2018 – On Sunday, March 11, Jack Flacco will be delivering a special message to Newmarket Youth entitled Leadership in the Ministry. 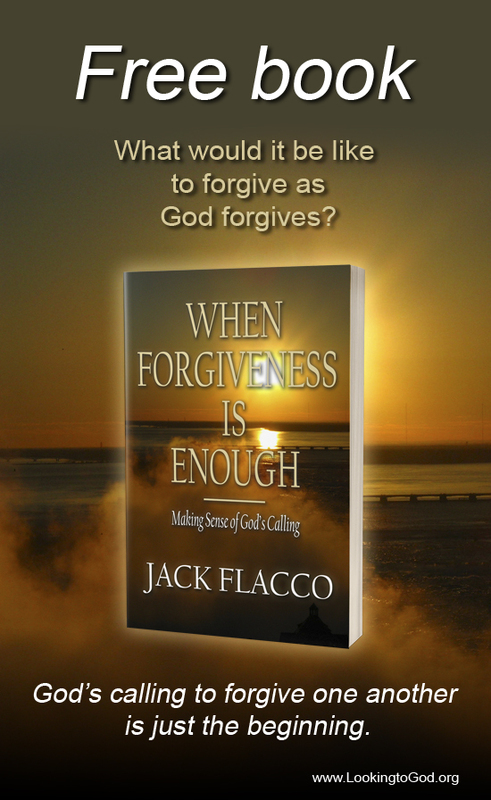 February 14, 2018 – Jack Flacco will be speaking in Newmarket on Sunday, March 4. Title of the sermon will be My Peace I Give to You. All are welcome! February 12, 2018 – On February 18, Jack Flacco will be delivering a special message to Newmarket Youth about desensitization in our walk with Christ. October 29, 2017 – Jack Flacco will be speaking in Newmarket on Sunday, November 5. Title of the sermon will be Forgive as God Forgives. October 24, 2017 – WHEN FORGIVENESS IS ENOUGH: MAKING SENSE OF GOD’S CALLING is available for download now. When Forgiveness Is Enough: Making Sense of God’s Calling, on sale October 24. July 23, 2017 – On July 30, Jack Flacco and his son will be delivering a special message to Newmarket Youth entitled Hearing God’s Voice. October 20, 2015 – RANGER MARTIN AND THE SEARCH FOR PARADISE, now on sale. There is no cure. The change is permanent. Whoever says they can fix this is wrong. Months ago, billions of people died in the zombie apocalypse. The survivors either have become refugees looking for a way out or have turned against each other. No one will admit they killed their friend for a package of raisins. It happens though, and there isn’t anything anyone can do about it. Undead slayer Ranger Martin makes the unforgiving Arizona desert his home. He has never had to defend it. He has never had to kill anyone for it. If anything, he has shelved his shotgun and has taken an early retirement package. When the military lays siege on his silo, Ranger and his crack team of professionals—a bunch of kids, really—have no other choice than to run. But after he discovers a map that may lead to a mythic city called Paradise, where neither army nor zombie can invade, Ranger mounts a cross-state journey to find the place of safety before the others find him and it’s too late. May 4, 2015 – Jack Flacco is proud to announce RANGER MARTIN AND THE SEARCH FOR PARADISE, the final book in the Ranger Martin trilogy, will publish on October 20. January 5, 2015 – Coming this fall, the final book to the Ranger Martin trilogy. October 21, 2014 – RANGER MARTIN AND THE ALIEN INVASION, now on sale. In a cold cemetery just outside American Fork, Utah, zombie slayer Ranger Martin sets his trap, four gas drums strung together and the barrel of his shotgun acting as the fuse. The undead crowd erupts in a blaze of body parts. If only all of Ranger’s enemies would die this way. What Ranger doesn’t know is his greatest foe may not be a hungry horde after all, but a vicious fiend bent on destroying the planet. They came from the sky. No one knew what to call them. By that time, it was too late. The dreaded lights from their ships plunged the world into darkness and everyone from Oregon to Virginia had disappeared. Now, with the towns and cities empty, no one will be able to stop the invaders’ brutal assault on the survivors. That is, no one except for Ranger Martin and a group of young tagalongs eager to once again reclaim the globe as their home. Together, they fight the elements, kill alien and zombie alike, and liberate the weak from their military oppressors. But will Ranger have enough time to defeat another wave of silver ships screaming toward Earth before it delivers its fatal payload? Or will he succumb to the whims of a sadistic, power-hungry general obsessed with eliminating anyone threatening his plans? May 5, 2014 – Jack Flacco is proud to announce RANGER MARTIN AND THE ALIEN INVASION, the second book in the Ranger Martin series, will publish on October 21. October 22, 2013 – RANGER MARTIN AND THE ZOMBIE APOCALYPSE, now on sale. May 6, 2013 – Jack Flacco is proud to announce RANGER MARTIN AND THE ZOMBIE APOCALYPSE, the first book in the Ranger Martin series, will publish on October 22. December 17, 2012 – Jack Flacco: The Official Site goes live. Featuring articles, photos and resources, the site promises to deliver a different viewpoint to the now-popular belief of a Zombie Apocalypse. Also featured, detailed writings of the post-apocalyptic madness that will grip the world, super female role models, and odd ramblings. All this and more in the coming months as Flacco readies his zombie book series for a Fall 2013 release. Thanks for likingmy recent post on easternshorbrent.Publishing my first novel is a little nerve-wracking so every nugget of support helps! Thanks again! Darn hit the return button too early. Congratulations! Nice. More Ranger Martin. Way to go, bro. Looking forward to the sequel!! Great cover and intriquing title! High impact and dramatic. Congratulations! Thanks! I’m looking forward to seeing what the cover to the second book will look like! So excited about your new book! Congratulations, Jack! Great cover! And the plot sounds intriguing — I’m looking forward to reading this novel! Thanks! Actually, if you click on the artwork you’ll see the Like button right at the bottom of the frame! Jack: Thanks for looking at my site. I will look for your book when it goes on sale. Hi, I saw you like a post of our blog levelog, I would like to read your book if I can get it from here, (Argentina) ahah, good luck! Thanks Jack for visiting my blog and liking my posts. You have a cool site, budy!! Liked it. I look forward to RANGER MARTIN AND THE ZOMBIE APOCALYPSE. Will you be offering readers any teasers, or samples? I’m presently reading, The Vampires of Soldiers Cove by Jessica MacIntyre. Thank you so much. I really hope you enjoy reading it once it comes out! Good news on the release date. Looking forward to reading it. That has to feel incredible. Congratulations! Thank you, Kaela! It’s feeling kind of surreal at the moment, but at the same time, so wonderful! Congrats on the book! Will there be a digital edition too? Thanks so much! Yup, ebook and paperback will be available on October 22. Thanks, Sandi! I’m looking forward to seeing it on the shelves! Hi Jack – Thanks for visiting my blog and I look forward to more of yours. Thanks for visiting my site. I hope you enjoyed it and I will follow your posts I love dystopian zombie books and I would love to read it when you release it.